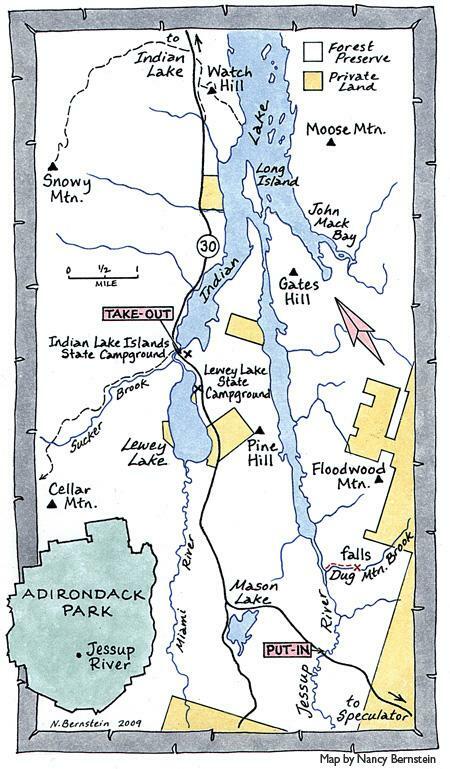 Skip & I rendezvoused at the Stewart’s shop on Route 12 in Mapledale at 7am with the intentions of paddling down the Jessup to Indian Lake to the NYS boat launch. 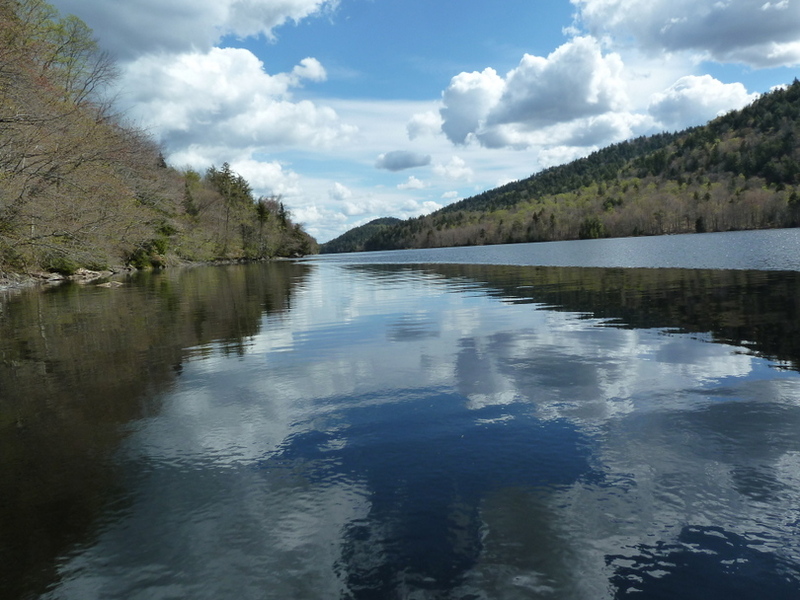 This involves a roughly ten-mile paddle; down 2.5 miles of Jessup River, five miles down the fjord-like arm of Indian Lake, then back south on the lake to the NYS boat launch. We met at 7:15am, drove to the Route 30 bridge over the Jessup, left our canoe at the put-in, left a car at the launch/take-out and were on the water paddling by 9:15. We paddled downstream on flatwater for 1.25 miles crossing over a couple of small beaver dams and trees in the stream. Based on previous trip reports we were looking for a set of rapids. 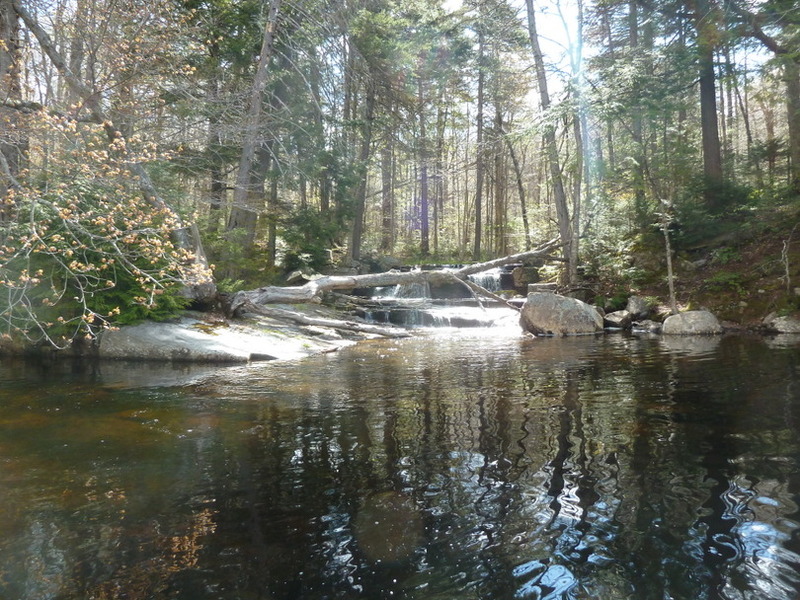 In our case the water level was just sufficient for us to pick our way through the rocks and avoid portaging the ¼ – ½ mile rapids along the right bank. Two miles from the start was the scenic Dug Mountain Falls (site of a notorious winter camping prank). Reaching Indian Lake we paddled north on a narrow arm of Indian Lake. We stopped for lunch at one of the designated NYS campsites at the the northern most extent of our fjord. After lunch we reversed our direction around Long Island and headed back south to the NYS boat launch to our car. Our total trip time was 3.5 hours including our ~20 lunch break.